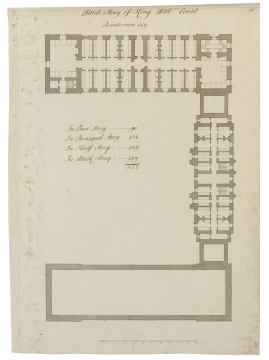 [12/21] Survey drawing of the attic floor of King William's Court, showing the accommodation layout, and with schedule of accommodation in whole court. You are here: CollectionsOnline / [12/21] Survey drawing of the attic floor of King William's Court, showing the accommodation layout, and with schedule of accommodation in whole court. In brown ink by unidentified hand, at top of sheet, Attick Story of King Will:[ms] Court / Private men 149, and in centre of plan, In Base Story - - 90 / In Principal Story - - 134 / In Half Story - - 149 / In Attick Story - - 149 / 522; and with numbered scale; and in C19 hand at top and bottom right, 25. The total accommodation for King William's Court in the list on this drawing falls short of the total of 544 projected in 1728 by 22. However, the resultant 522 may not be correct, as the numbers of men given for each level of the building do not coincide with the numbers of cubicles in each case. On this floor the number is 139, not 149, as stated in the title. On the basement floor it is 62, not 90; on the principal floor 62, not 134, and on the mezzanine floor, 148 not 149 (see Notes for [12/15, 17 and 19]). The total number of cubicles drawn on the four levels of the buiding is therefore 411, not 522. See Notes on [12/22] for figures for Queen Mary's Court. One reason why King William's Court proved inadequate for the provision of bed space for men is that its west wing was originally conceived as the entry block to the entire Hospital (see Notes on [6/1]). This part of the building was designed as a separate pavilion, its rooms presumably intended for administrative use rather than for the accommodation of men. The more rational planning of the equivalent range of Queen Mary's Court produced huge gains in bed accommodation (see [12/18 and 20]).